The Kähler-Ricci flow is a flow of metrics on a complex manifold that satisfies a PDE which is a nonlinear analog of the heat equation. A solution is a flow of metrics which will tend to smooth out the irregularities in the curvature on the manifold. In our summer project we numerically approximated solutions to the PDE on the complex torus (which, for a given metric, will look like a deformed doughnut) in order to investigate the rate at which the metric converges to the flat metric. Our aim was to compare the rate of convergence with conjectured bounds and our results were consistent with these conjectures. To tackle this project, the students first acquainted themselves with the notion of a complex manifold, which is, roughly speaking, a smooth geometrical space that can be described by coordinates consisting of complex numbers (a natural example is the complex plane itself). Then we were able to formulate the PDE of interest to us in the case of a torus (which can be realized as a complex manifold). We learned various techniques for numerically approximating the solution to a PDE, and, with extensive coding in MatLab, were able to generate a great deal of concrete examples of tori who were originally deformed due to an irregular curvature but would 'flow' in time toward a more smoothly dispersed curvature. An isometry is a linear map that preserves the norm. Isometries on the finite dimensional inner product space are orthogonal matrices or unitary matrices. There are relatively few isometries if the norm of the finite dimensional vector space does not come from an inner product. In this project, we study a generalization of isometries — high order isometries. Numerical and symbolic experiments discovered many higher order isometries when the norm is closely related to an inner product norm. We would like to prove these numerical results in a future project. 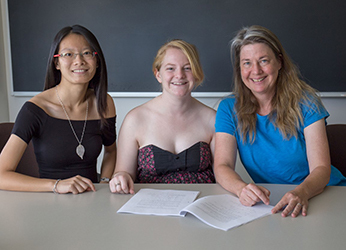 Mollie Zechlin and JingTian Isabella Ye worked with Professor Linda Patton to study unitary invariants for 4 by 4 matrices. There is a known list of 20 traces involving a matrix A and its conjugate transpose A*. Equality of these 20 traces for two matrices A and B is necessary and sufficient for the matrices to be unitarily similar. Our group made the additional assumption that the matrices are nilpotent. This assumption implies some of the traces are automatically zero so they can be eliminated from the list when checking unitary similarity. Our conjecture was that some of the other traces might be redundant in the nilpotent case. Although we were unable to definitively determine that, we did create examples showing that most of the traces could not be eliminated from the list. Jeffrey Lee worked with Joyce Lin to study the speed of action potentials, not simply along the surface of the heart, but also in the depth of the heart tissue. When an electrical signal passes through heart tissue, the muscles contract and allow blood to pump through the body. This electrical signal is called an action potential (AP). The speed of the AP has been studied as an indicator of arrhythmia — abnormal heart beats — and heart failure. We have excellent simulations of the AP, but given the complexities of the cardiac cells, this is only computationally feasible in a tissue sheet. How does this extend to a full three-dimensional heart? We were not able to complete this project during the summer, though Jeffrey found some interesting trends. In the spirit of Learn By Doing, Jon Lindgren has been working with Erin Pearse and Joyce Lin to develop pedagogical materials using a 3D printer. These manipulatives are designed to enhance student learning in the calculus sequences and other upper level courses, providing hands-on visuals for abstract concepts. Nonlinear internal waves, a well-established feature of the coastal ocean, play an important role in various physical and biological processes, including vertical mixing. 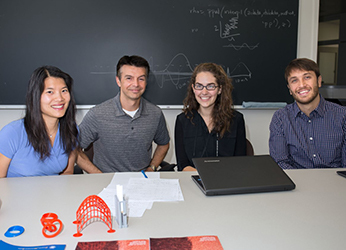 In our summer project, graduate student Caleb Miller and undergraduate student Sidney Arthofer worked with Paul Choboter and Joyce Lin and physics Professor Ryan Walter to explain the ability of a fully nonlinear mathematical model — the Dubreil-Jacotin-Long equation — to describe field observations with a strong background shear current. This interdisciplinary study utilizes mathematical techniques, numerical simulations, and field observations to answer important questions about internal wave characteristics and water column stability. This research was extended through the 2016-17 academic year, with undergraduate Jeffrey Lee joining the research group. 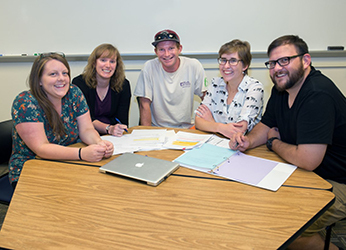 Math students Andrew Crosby, Brian Keating, Lacey Christopherson and Kathryn Voltmer spent the summer working closely with Danielle Champney studying data on the assessment of several unique classroom systems from fifth grade through college. Crosby and Keating also worked with alumnus Ben Woodford (B.S., Mathematics, ’12; Single Subject Credential, Mathematics, ’14) on designing curriculum on Growth Mindset for the New Tech High School teacher professional development program. Christophersen and Voltmer spent additional time thinking deeply about student engagement in fifth grade math. The team produced several papers and posters in progress based on the summer research. 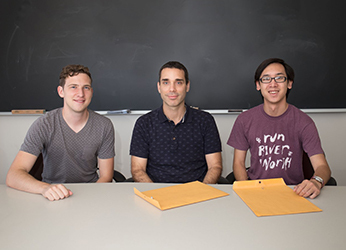 Professor Jeffrey Liese worked with students Jordan (Jojo) Brooker, Alfredo Ramirez and Kevin de Szendeffy studying the asymptotics of minimally overlapping permutations. A permutation p is said to be minimally overlapping if there no integer k>1 such that the first k integers of p are in the same relative order as the last k. Previous work included finding a bound on the probability that a random n-permutation is minimally overlapping as n tends to infinity. This summer, the students worked on obtaining some exact results with the ultimate goal of precisely determining the aforementioned probability. Although this probability still remains unknown, the group was able to produce some partial results. In particular, they provided some explicit formulas for the number of permutations that overlap in certain specific ways. Perhaps future work on studying other types of overlaps could yield enough information to characterize the asymptotics of minimally overlapping permutations. Zachary Cooperband also participated in summer research advised by Dave Camp.